All Saints Camp Celebrates its 34th Year! A sleep-away camp for those entering third grade through those who just graduated high school, All Saints Camp is set among the pine trees of Prescott, Arizona this June 2 through 8. This year, our program will again be held at Whispering Pines Camp. Our theme this year is "You Are Witnesses", taken from Luke 24:36-53, the Gospel reading for the Feast of the Ascension, which falls on the Thursday of All Saints Camp this year. Our program offers an experience of fellowship and fun, with activities ranging from campfires to Olympics, all within the context of living an Orthodox Christian life of daily Matins, Vespers, and discussion with clergy. To bring the youth and staff of All Saints Orthodox Summer Camp closer to Christ and one another through a safe, fun, and prayerful environment. This is accomplished with our trained staff who are all working to grow in their faith! There hasn’t been a summer in nearly the last twenty years when Fr. Apostolos has not been involved in camp ministry! For over a eleven years as Dean of Assumption Cathedral in Denver, approaching six years at Holy Trinity Cathedral in Phoenix, and many years with the other parishes where he has served, Father has been a strong force in the realm of youth ministry programs: GOYA, Joy, HOPE, VCS, OCF, to name a few. With these programs, Father has led trips to Greece, Guatemala, and LA’s Skid Row with OCF’s Real Break program, spent summers at Ionian Village as the Papa, and been a part of All Saints Camp in previous years—not to mention the innumerable youth retreats, service projects, and outings. Father is both prayerful and excited for this summer. He can’t wait to meet you all! A native of Virginia, come to Arizona by way of Boston and California, Fr. Jacob Saylor is a priest at the Assumption Church, in Scottsdale. Fr. Jacob has extensive youth ministry and camping experience, having served at Ionian Village, as well as the summer camp programs of the Metropolises of Atlanta, San Francisco, and the Direct Archdiocese District. In his fourth year as Program Director, he is already anticipating how transformational and truly amazing this summer will be. Excited about the relationships that will be forged, the fun that will be had, and the spiritual growth that will no doubt change us all, Fr. Jacob is ultimately thrilled about the things God has in store for us this summer! Summer camp has been a part of Evan's life for as long as he can remember. Growing up at St. Nicholas Ranch, he was blessed to not only enjoy coming in contact with countless youth from across the Metropolis, but also living near the Monastery of the Life Giving Spring helped him to grow in the faith he possesses today. Evan has participated in camps for over twenty years—from years spent as camper and staff at St. Nicholas Ranch, to participating on staff at Camp Saint Paul in New York, to acting as program director for the vacation church school, Faith and Fun Camp, at Holy Trinity Church in San Francisco—he's been all over youth ministry. Evan cannot wait to see where All Saints Camp goes: this year and beyond! When John was introduced to the zany world of summer camp in 2016, he was hooked. 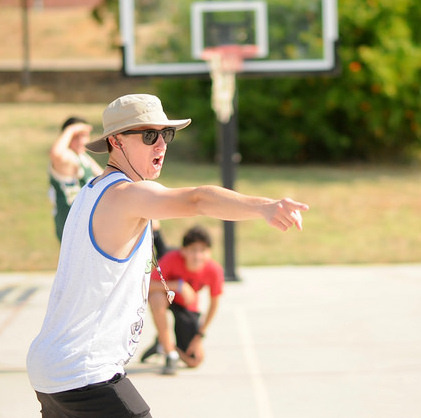 Although he is known for his ridiculous costumes, questionable hat choices, and terrible dance moves, John loves to work hard to make each camp a memorable experience for every camper. As a true native of Phoenix, John has found a home in All Saints Camp. Currently, John is finishing the Master of Accountancy program at Arizona State University and counting down the days until June 2, 2019. John is excited to be working alongside and learning from the very best camp directors and staff in the United States. He is looking forward to seeing all of the beautiful faces of the campers that make All Saints Camp the amazing place that it is! Watch out All Saints Camp - you have a new Girls’ Director coming in hot! Presvytera Jordan is looking forward to returning to ASC this summer, her seventh serving under the Metropolis, and adding that female influence that has been missing! Hailing from the great Central Valley of California, Pres. Jordan is no stranger to the Arizona sunshine and heat! After graduating with a BS from Cal Poly San Luis Obispo in the environmental sciences, she decided to take a crack at the “Valley of the Sun” and earn her Masters of Elementary Education at ASU. Currently, she is working at a learning center and nannying - she just can’t get enough of the kiddos! When she isn’t working, Pres. Jordan is volunteering at the church, working youth events and retreats, teaching Sunday school, and attending Philoptochos functions. She also enjoys a good game of Jeopardy, hiking, online window shopping, and of course, building houses at Project Mexico & St. Innocent Orphanage! Pro tip: give her popcorn, and she will do anything for you! But wait, there’s more! This year your Girls’ Director comes in a package deal - Fr. Jacob and Pres. Jordan are expecting their first future camper in early August! Their sweet boy cannot wait to hear all of the loud music and prayers that make summer camp all the more special! See you soon ASC 2019!